Enjoy a one-of-a-kind family destination! Ride the scenic Chondola to the summit of Anakeesta, stroll our Tree Canopy Walk, discover the Children’s Treehouse Village Playground, race side-by-side on the Dueling Ziplines, soar on the Rail Runner single-rail mountain coaster, and so much more! The mountains are a place for adventure and relaxation, exploration and wonder. A place where people of all ages can discover nature and family entertainment. You and your family will find lots of fun things to do in the Great Smoky Mountains at Anakeesta. Want to see what it looks like at Anakeesta right now? Enter Anakeesta via our scenic Chondola. Choose to ride in an open air 4-person chair with safety bar or select an enclosed gondola cabin with seating for 6. This scenic ride takes you up 600’ to the summit of Anakeesta Mountain where you will enter the whimsical Firefly Village. 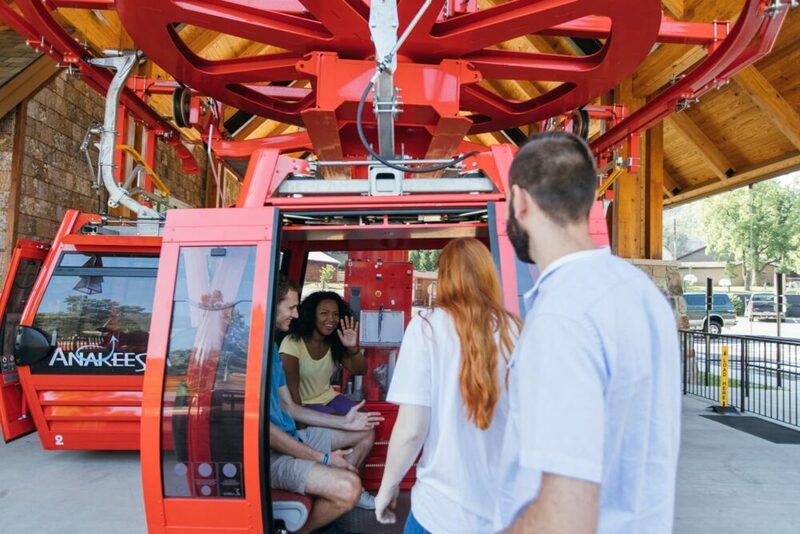 Soar above the City of Gatlinburg and leave the sounds of the City behind. Below the Chondola is a historic campus and natural habitat that is home to our neighbors and many forest friends. If you are quiet you just might see a bear! Please be sure keep your voices low and secure all loose items. Enjoy the ride and get ready to experience the magic in the mountains! Immerse yourself in the beauty of nature on our scenic Tree Canopy Walk. 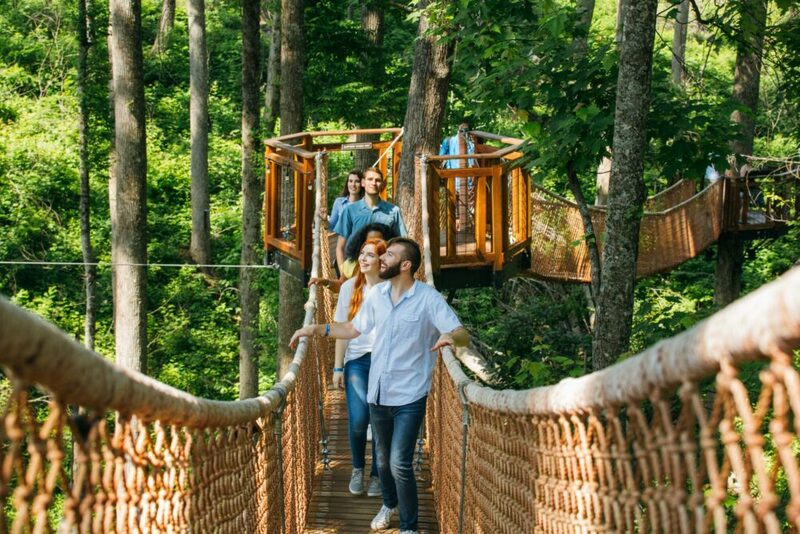 Experience what it feels like to be a bird in the canopy as you stroll 40’ – 60’ above the forest floor along with a series of 16 connected sky bridges suspended in the trees. Each bridge leads to a new observation platform where you can take in the sights, learn about your surroundings with our engaging interpretive signage and enjoy the spectacular views. Keep a sharp eye, you may spot a bear on the forest floor below or a woodpecker in the treetops. 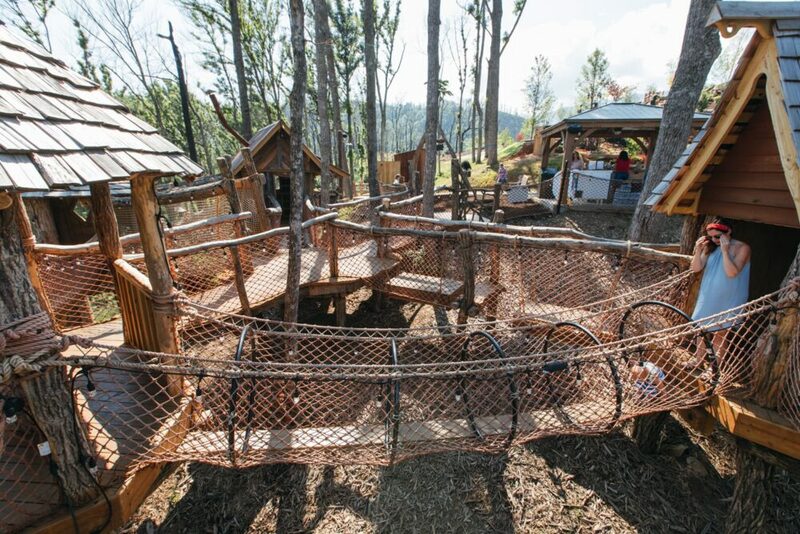 Children of all ages will love playing in the trees in this whimsically themed treehouse village interconnected by multiple bridges of varying challenge. Physical and educational elements designed to build strength and confidence will surprise guests at nearly every turn. Trek along a log walk to an elevated bird nest to learn about how an American Goldfinch cultivates its home, navigate a plank walk to a maze encapsulated by a house in the trees, and crawl through a tube net to a climbing adventure within the walls of nature. Zip through the treetops on Anakeesta’s Dueling Zipline Adventure. 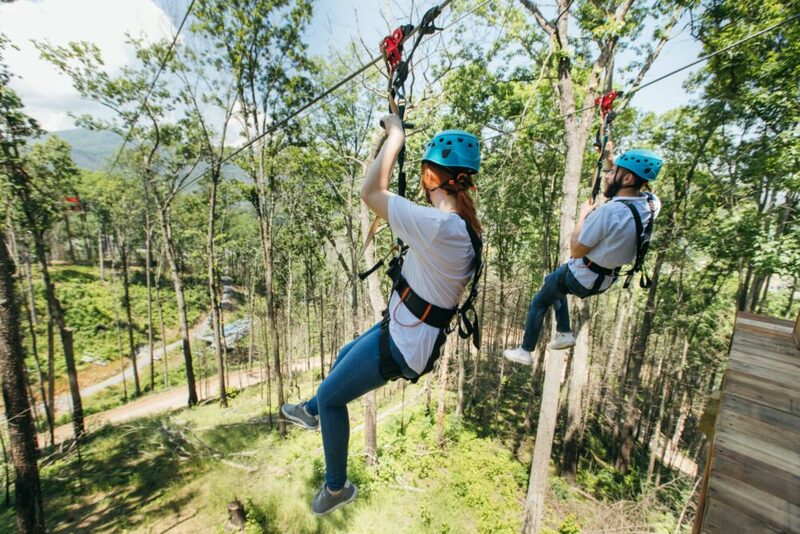 Stretching high over the forest floor, all three zips offer beautiful views of the Smokies while zipping side-by-side, right next to friends or family. Along the way, you’ll be able to test your courage at our two challenge stations where you’ll rappel off our platforms and enjoy a controlled descent to a cushioned platform below. Zipline guests end their journey via a short downhill path to our Chondola mid-station and ride the Chondola back to the summit of Anakeesta to continue your adventures! Anakeesta’s new single-rail mountain coaster is the first of its kind in the United States! As a single-rail line, riders can ride lower to the ground on a single track creating a thrilling and unique experience as you race through the trees while flying down the mountain. It also allows you to control your own speed so if you prefer a slower pace you can do that too! The Anakeesta Rail Runner takes you on an exhilarating downhill ride with a 400 ft. elevation change and can hit speeds of 25 mph. The ride begins with 1,600 feet of downhill twists and turns and ends with a scenic uphill ride back to the top of Anakeesta Mountain. Riders can ride solo or tandem with a small child. Our Rail Runner carts feature back and headrests for a comfortable and safe ride. Rail Runner is weather dependent. Strike it rich at the Anakeesta Gem Mine! An interactive waterfall and sluice allows kids of all ages to search for that special gemstone or fossil. 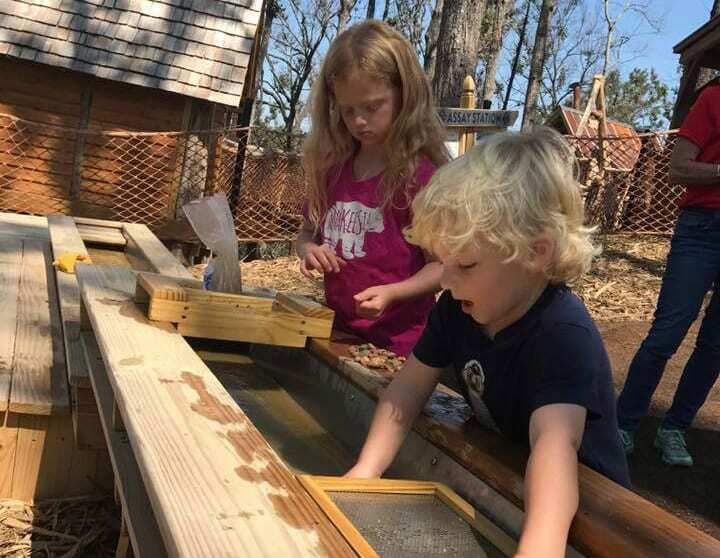 Located at the beginning of the Tree Canopy Walk and adjacent to the Children’s Treehouse Village Playground, Gem Mining is always a fun family activity.